Therapeutic communities recently celebrated 40 years since the birth of the Association of Therapeutic Communities (ATC) with round table discussions held last month at the University of Nottingham. The focus for the event was ‘Re-birth in a time of austerity,’ specifically reflecting on the past 40 years and discussing what the future may hold for TCs when the ATC is re-launched in a new guise later this year. The day covered several topics including leadership and charisma, research, management and organisation, publishing, staffing and education. Yet the big question on everyone’s mind was the future of TCs. As Nick Manning recently noted in his post, TCs have not made the impact that they perhaps could have done. With the closure of some TCs, the threat of closure for others and the continual challenges for NHS TCs, the future is looking uncertain at best. During the celebratory event, the point was made near the end of the day that it is unlikely that TCs will ever truly fade away. Much like the performing arts and theatre, which continuously face hardships and funding crises, TCs will simply keep forming and reforming. I tend to agree with this argument, not least because TCs are about people and the quality of relationships. Therapeutic communities aim to provide a safe environment whereby troubling relational patterns can be explored, often reprising the dynamics found in family relationships (Jones 1976). By using a variety of therapeutic approaches, an unhelpful social reality can be challenged, reconstructed and ultimately transformed. TCs employ interpretive techniques from both staff and user community members to help the latter learn a healthier way of relating in their own social world. Thus social interactions and relationships are at the core of the therapeutic work that occurs within TCs. Middleton et al (2011) argue that supportive relationships during a therapeutic programme are valued most by service users and are the most influential in terms of recovery. Qualities such as feeling ‘safe’, ‘understood’ and ‘accepted’ are of paramount importance to people receiving care. Incidentally, these are also some of the core principles upon which TCs are based (Haigh 1999). In determining where money should be spent however, funding commissioners are interested in value for money and whether or not a treatment is effective. Whilst there is research to demonstrate the effectiveness for specific therapeutic approaches such as cognitive behavioural therapy, Pilgrim et al (2009) writes that is the quality of relationships that ‘consistently predicts outcome, independent of the espoused model or condition being treated’ (244). This is good news for TCs who place such a high value on helping individuals establish a healthier sense of self-identity and social relationships. Yet it is hard to justify value for money when the relational approach favoured by TCs does not lend itself easily to the operationalised frameworks required by healthcare commissioners and funding bodies (Morant and Manning 2005). There are no simple solutions to these funding challenges facing TCs. The future for TCs may look uncertain. However, the importance of relationships in the human experience will never be diminished. As individuals and relationships are at the heart of TCs, perhaps, in some form or another, they will never truly fade away. So the question then remains, what will the next 40 years bring? health and mental health. New York: Human Sciences Press. Community Research. Therapeutic Communities, 26(3), 227-243.
crisis resolution and home treatment. Health Sociology Review, 20(2), 147-156.
study of health, illness and medicine,13(2), 235-254. Melanie Jordan – Institutional (e.g. prison) settings and mental health: Goffman revisited? Institutional (e.g. prison) settings and mental health: Goffman revisited? According to Goffman (1961), upon entrance to total institutions (prisons, asylums, monasteries, army camps, etc.) inmates may begin ‘a series of abasements, degradations, humiliations, and profanations of self’ (p. 24). Inmates’ conception of self ‘is systematically, if often unintentionally, mortified’ (p. 24). The processes of admission to an institution mark ‘a leaving off’ (p. 27) from the ‘conception of himself made possible by certain stable social arrangements in his home world’ (p. 24) and ‘a taking on’ (p. 27) of ‘activity whose symbolic implications are incompatible with his conceptions of self’ (p. 31). However, is consideration and/or utilisation of this — albeit seminal — institutionalisation work of Goffman (1961) apt today? (N.B. You are warmly invited to note your comments below this post). In relation to the prison milieu, it is argued ‘social integration may play a different role for persons incarcerated in total institutions than among the general population due to unique prison conditions’ (Lindquist 2000:431). For example, Schmid and Jones (1993) found inmates’ ‘prison careers’ (p. 439) to be creative processes ‘through which inmates must invent or learn a repertoire of adaptation tactics’ (p. 439). ‘A person who is incarcerated for the first time becomes a “prisoner” but does not automatically acquire a meaningful status within the prison world’ (p. 439, double quotation marks in original); this suggests individuals move from free society with its (either prescribed or imagined) statuses to the prison setting with its absence of meaningful ascribed statuses. Incarceration experiences are, therefore, somewhat subjective and fashioned by individual prisoners. It is reported the prisoner population shares ‘the experience of being pulled in psychologically different directions’ (p. 443). Notably, assimilation into the penal environment remains salient here — in the 1990s. To return to the broader application of Goffman’s work, more recently — in 2011 — Mac Suibhne (a Senior Registrar at St Brigid’s Hospital, Ardee, Ireland) concluded: ‘Goffman’s key role was in humanising patients and drawing attention to the patterns of interaction that dehumanised them’ (p. 1). Arguably, this notion of de/humanisation of patients/persons in institutional settings appears somewhat perennial — as a pertinent academic, clinical, political, etc. topic (e.g. http://news.bbc.co.uk/1/hi/health/8101325.stm or the BBC1 Panorama programme Undercover Care: The Abuse Exposed (May 31st, 2011). Thus, perhaps renewed attention to Goffman’s mid-twentieth century work is appropriate for health and social care academics, clinicians, etc. today? Lindquist, C. (2000) ‘Social integration and mental wellbeing among jail inmates’, Sociological Forum, vol. 15, no. 3, pp. 431–456. Mac Suibhne, S. (2011) ‘Erving Goffman’s Asylums 50 years on’, The British Journal of Psychiatry, vol. 198, pp. 1–2. Schmid, T. and Jones, R. (1993) ‘Ambivalent actions: prison adaptation strategies of first-time, short-term inmates’, Journal of Contemporary Ethnography, vol. 24, no. 4, pp. 439–463. Last month, a research team across the Universities of Bristol and Bradford and the Mental Health Foundation released their report into best interests decision-making under the Mental Capacity Act 2005 (MCA). The MCA allows for (among other things) decisions to be made for an individual when that person is found to lack the capacity to make the decision for herself. If the individual is found to lack capacity, then a decision can be made on her behalf in her ‘best interests’. The research team looked at a great deal of aspects around this decision-making process, but I was particularly interested in their findings regarding the first step: determining capacity. – and communicate their decision. This test is primarily one of cognitive function; the quality of the decision reached by the individual should not be of issue, but rather the process by which they get there. In section 1 of the Act, which outlines the principles underlying the legislation, it is quite clearly declared that ‘a person is not to be treated as unable to make a decision merely because he makes an unwise decision’. On paper, this sounds relatively simple – essentially, try not to be too judgmental about people’s decisions, and observe instead their cognitive functioning ability. What the report reveals, however, is making the distinction between an unwise decision, and one which results from a lack of capacity, is difficult for health and social care practitioners, and what seems to be happening in many cases is those individuals who have specific disabilities or histories are being assumed to lack capacity, when they make what appears to be an unwise decision. Another result of this research has been the discovery of what the team call a ‘concertina effect’, where capacity decisions are being made simultaneously with decisions about what action is in the individual’s best interests. They suggest that often, a decision has already been made about what course of action should be taken, and therefore a finding of a lack of capacity had to be found in order to implement it. These two findings put together put a rather worrying light on practice around mental capacity issues. The MCA was supposed to institute a functional test of cognitive ability, rather than a status test whereby an individual with a specific diagnosis is presumed to lack capacity by virtue of that diagnosis, or an ‘outcome’ test, where those decisions which are ‘unwise’ are deemed to be incapacitous; the thrust of this is that we should not question someone’s capacity merely on the basis they have an intellectual or cognitive disability, and are making what we perceive to be a silly decision. What the findings of the study suggest is that the ‘status’ and ‘outcome’ approaches seem to be alive and well in practitioners practice, and that there is no space for the making of unwise decisions when you have an intellectual or cognitive disability. All of this should be more concerning when we consider the massive leap which Article 12 of the UN Convention on the Rights of People with Disabilities (CRPD) presents in our thinking about mental capacity. Article 12 declares that everyone; has the right to enjoyment of legal capacity, and that the State must provide adequate supports to enable that capacity to be exercised. The MCA itself is a relatively progressive piece of legislation and should be praised, but it has to be questioned what good it is if, regardless of the letter, even the spirit of the law does not appear to be followed in many cases. If such attitudes still persist, almost five years since the MCA came into force, then what hope does the rather more dramatic ‘paradigm shift’ of the CRPD have for changing fundamentally the way we treat people with different levels of intellectual and cognitive functioning? Of course they hadn’t – he hadn’t let it. He hadn’t `owned’ nor engaged in the reforms. The advent of practice based commissioning (pbc) with devolved GP budgets promised change and GPs began to get interested, but there was frustration because of the differences between their local concerns and commissioning by a PCT delivering for a wider population. Advent of CCGs did re-enthuse some local GPs who found themselves as clinical leads, able to directly redesign pathways and negotiate with providers in contracting. It could also be argued that some degree of `tribalism’ emerged. GPs feeling that have been regarded for years by consultants as not quite having their status and here was a chance to demonstrate who really had power in the NHS – especially in face of a 45% reduction in commissioning managers. For others, it was an opportunity to make real change for their communities. Tear down the traditional structures and let a thousand flowers bloom said Mao during the Cultural Revolution (though Conservatives prefer `creative destruction’). Early indications are that GP engagement is having a positive impact in some areas. However, it has rapidly become clear that the `Maoist’ promise of the reforms is already beginning to take a decidedly centralist/ managerialist turn. The lack of checks and balances on the role of the NHSNCB (National Commissioning Board) and the promise of increased performance management around nationally set criteria and area wide Health and Wellbeing Board targets brings with it the realisation that CCGs won’t have the envisaged freedoms. The `thousand flowers’ must all be the same otherwise there would be a `post code lottery’, something the NCB would not countenance. There are also significant concerns over governance within the commissioning structure and how CCGs can quality assure increasing numbers of providers under AQP with less managerial resources. Privatisation of commissioning support does not increase resource and brings with it other concerns. There is already talk in DH on the `optimum size’ of a CCG (and it’s not too far off the size of the early PCTs) so concerns about loss of `local focus’. There is also realisation that this may be a `divide and rule’ of doctors to bring in the Governments own `cultural revolution’ around a privatisation agenda. GPs may be being `set up’ to take the blame for this, rationing and other failures in the NHS as it is forced to do more with less resource, and against rising patient expectations – ironically, perhaps, fuelled by the CCGs own community engagement activities. These reforms are happening on `Their Watch’ and GPs are very aware of that. There is enthusiasm for clinical commissioning – GPs like it and I personally believe it is the way forward – but these are not the right reforms to facilitate it. They have not been fully thought through. In some areas I’m sure CCGs will succeed brilliantly and be able to bring some local flavour despite having to with adhere to National and regional commissioning agendas. In other areas they will fail badly and there is little governance provision for failure other than forced merger with another CCG. The risk is that enough failures would discredit the use of clinicians in commissioning for a decade to come. Campling et al. (2004) argue we are all constructions of our environment and of each other, developing our identities, learning patterns of communicating, and our social responses in the context of our social environment. ‘The quality of our physical environment can be health giving or health destroying’ (Howard 2004:69). Johnson and Haigh (2011) review the Royal College of Psychiatrists’s latest initiative, the Enabling Environments (EE) project. This novel 21st century approach can be considered a development of the preceding therapeutic environment treatment methodology and the therapeutic community movement; the principles of EE represent an adaption of these values and standards in reference to contemporary society and the current nature of mental health (Johnson and Haigh, 2011). The EE system intentionally identifies features in any given setting that foster a sense of connected belonging for the involved social actors ‘and suggests a process by which these principles can then be customised for specific settings’ (Johnson and Haigh 2011:17). Two new concepts from the EE initiative are noteworthy here: the psychologically informed environment (PIE) and the psychologically informed planned environment (PIPE). To summarise, both of these approaches strive for greater psychological awareness of a setting, humane and enlightened treatment, enhanced wellbeing for all involved, plus reflective practice and shared action learning in the staff team (Johnson and Haigh, 2011). The PIPE scheme is designed for high security or high risk settings (e.g. Her Majesty’s Prison Service). It is argued, by Johnson and Haigh (2011), that the EE initiative signals a new approach to social psychiatry and has implications for both public mental health and social policy in the UK: ‘the enabling environment approach is as broad as it is ambitious’ (p. 22). To relate these debates to my own area of interest (i.e. prison mental health): Johnson and Haigh (2011) detail nine core elements to the provision of EE; four of these are important in relation to the prison setting: ‘a positively enabling environment would be one in which the nature and the quality of relationships between participants or members would be recognised and highly valued … where engagement and purposeful activity is encouraged … where power or authority is clearly accountable and open to discussion … where behaviour, even when potentially disruptive, is seen as meaningful, as a communication to be understood’ (pp. 19–20, ellipses denote removed sections). These four ideals are poignant as a) the importance of quality relationships between those with differing social roles in the prison setting is not always considered critically, b) the quantity of worthwhile activities provided for prisoners is (in some prisons) arguably diminutive, c) the power relations in a prison (e.g. between wing staff and prisoners) are not often debateable, and d) disruptive behaviour often results in sanctions in the prison environment and perhaps insufficient attention is devoted to understanding underlying causes of socially deviant actions in the setting. The EE vocabulary of shared values is the basis for the practical application of the approach; this is problematic in the prison setting, as the underlying goals of the NHS and HMPS are somewhat dissimilar (e.g. care versus containment). Thus, to conclude, the EE initiative serves to highlight the worthy prisoner versus patient issue in prison establishments. Click here to see Nick Manning’s post. Campling, P., Davies, S., and Farquharson, G. (2004) (Eds) From toxic institutions to therapeutic environments: residential settings in mental health services, London: Gaskell. Johnson, R. and Haigh, R. (2011) ‘Social psychiatry and social policy for the 21st century: new concepts for new need – the Enabling Environments initiative’, Mental Health and Social Inclusion, vol. 15, no. 1, pp. 17–23. Howard, T. (2004) ‘The physical environment and use of space’, in P. Campling, S. Davies, and G. Farquharson (2004) (Eds) From toxic institutions to therapeutic environments: residential settings in mental health services, London: Gaskell, pp. 69–78. As part of my role as the Institute’s arts co-ordinator I have taken on the weighty task of commissioning an artwork to mark the opening of our new headquarters in May 2012. How do you represent mental health in a sculpture? This will be the task of an artist who will work with mental health service users, a local artist, and healthcare students over the summer. This series of blog posts will chart the sculpture’s progress, from the background to the project, through its design, and finally its installation right outside the entrance to our new building. Not to forget the grand unveiling in November! You’ll be getting updates from me and also mental health servicer users, students and the sculptor. Oh, and there’ll be lots of pictures of course! Art in the Institute: With the generous support of Nick Manning and Gerry Carton, since 2009 the Institute has been hosting successful art exhibitions in partnership with City Arts (http://www.city-arts.org.uk/). 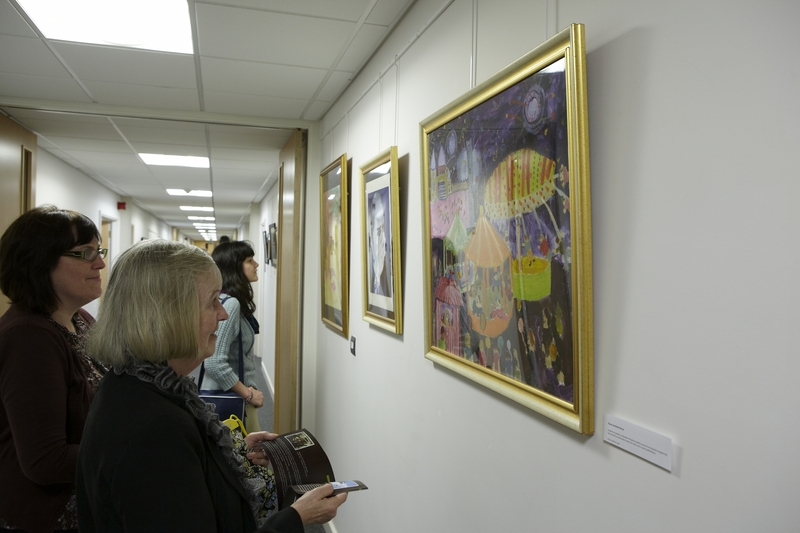 The exhibitions have added colour and interest to the Institute offices and more importantly have created opportunities for staff, students and people with mental health difficulties to display and sell their artwork. 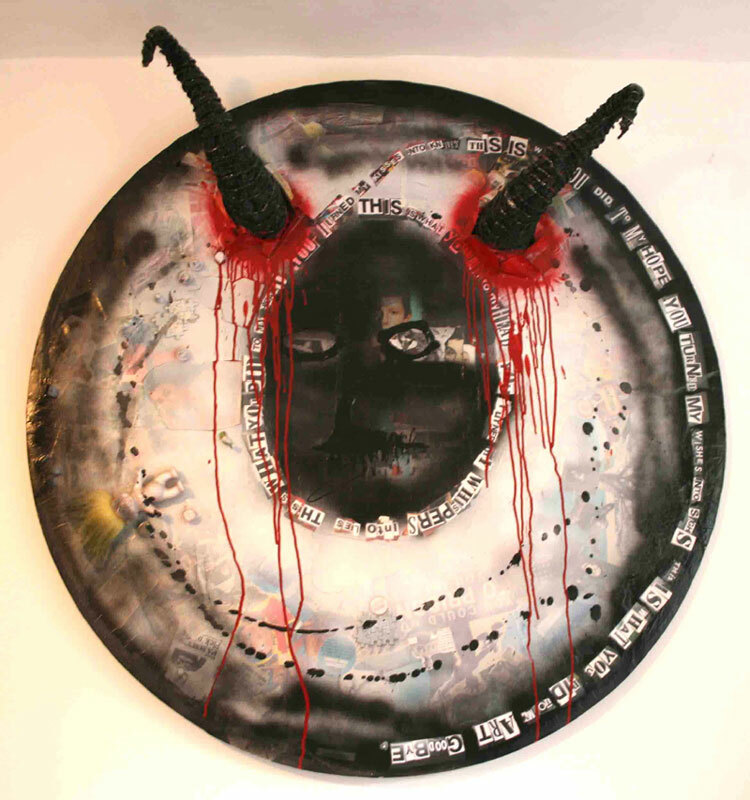 The exhibitions have proved popular with staff and visitors (see PDF: review_identity) even though some of the work included is challenging, see Vince Law’s ‘This is what you did to my head 2’ part of current ‘diversity exhibition’. Many an interesting conversation has been overheard in the corridors about the work on display. I am a strong advocate for the therapeutic usefulness of art for people who experience mental distress and the exhibitions help to promote social inclusion by giving people who may feel marginalised the opportunity to display their work. We have an opening for each exhibition to which we invite artists and staff. 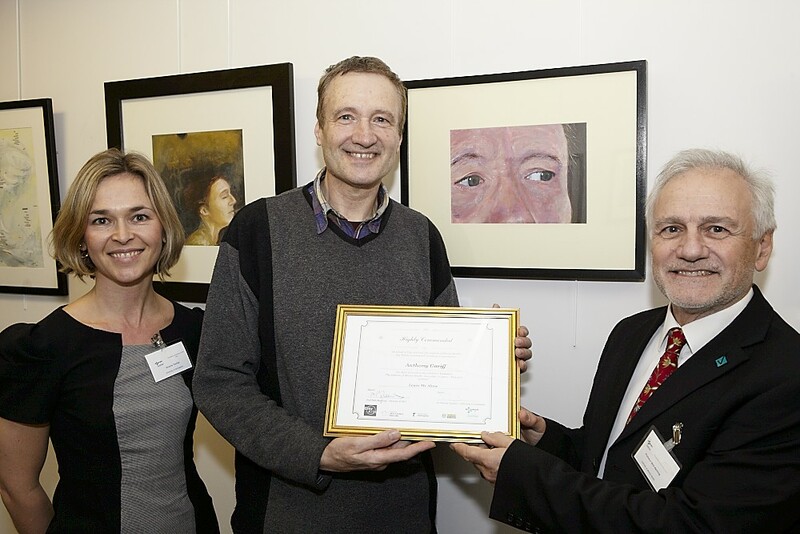 We offer awards, here are Nick (IMH Director) and I giving an award to artist Anthony Gariff in front of his work. A guest judge helps me with this task, for the current ‘diversity’ exhibition it was the talented artist and doctor Ian Williams (http://graphicmedicine.org/). Exhibiting has a positive impact on artists taking part see for example http://jennamichellepinkartist.tumblr.com/post/12563841079/city-arts-exhibition. For me, one particularly memorable encounter was with an artist who approached me at an exhibition opening. She has obsessive compulsive disorder and anxiety and has a long history of involvement with mental health services. She was accompanied by a carer and she held out her trembling hand towards me. Fighting back tears she thanked me, telling me how much it meant to her to have the opportunity to show her art on the Institute’s walls and for staff to be able to view her work. It seemed natural to plan a special artwork to mark the opening of our impressive new headquarters. The hardest part thus far has been fundraising, not straightforward in these tough economic times. Yet, ably assisted by Tim Harris, an arts and culture consultant www.timharrisconsultancy.co.uk. I have raised an impressive £32 K for the project. An advert (see PDF: IMH sculpture advert copy) to find the right sculptor was sent out at the beginning of February. Since then we have responded to requests for further information from almost 200 artists from far and wide, even from the USA! Thanks to Tim and Phil Wain for helping with this. A small group including university and Institute staff, a curator, an artist, a service user, and a medical student will gather soon to shortlist 3 artists. They will create maquettes (models) to go on display online and in the Inst offices for you to comment on and choose your favourite. I will be visiting Rampton hospital soon to consult with patients there about the project, giving them a chance to have some input into the sculpture design. What do you think the sculpture should look like? Let me know. More soon. Victoria.